ProWhey with Organic Raw Chocolate is produced in New Zealand from milk provided by New Zealand dairy cows. The milk is harvested from cows that graze on pesticide and chemical-free natural grass pastures. This Whey Protein Isolate has been tested for residues and is free of Recombinant Bovine Growth Hormone (rBGH). ProWhey is minimally processed so that the proteins remain undenatured, soluble and have utmost physiologic activity and benefit. ProWhey contains naturally occurring immunoglobulins, powerful physiologic factors that help support and maintain a healthy immune response. Organic raw cacao naturally protects cells from the damaging effects of oxidation, iron, magnesium, and fiber. Raw Cacao is processed at minimal temperatures to preserve these naturally occurring nutrients. The cacao in our whey powder is sustainably produced under fair trade labor practices. Recommended Dosage: 2 heaping tablespoons 2-4 times daily in 8oz fluid (or soft food), or as directed by a healthcare practitioner. Mixing Instructions: Place powder into glass with 1-2 ounces of warm water and mix thoroughly with a fork. Once the powder is dissolved, add the remaining water, juice, or desired drink to make 8 ounces. Independently tested for whey protein authenticity, protein potency, melamine, heavy metals, herbicide & pesticide residue, stability and bacteria, yeast and mold counts. 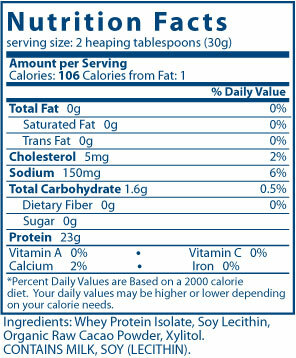 EXCLUDES: Coatings, Binders, *Gluten (wheat, rye, barley), *Soy Protein, *Egg Protein, Sugar. Store sealed in a cool dry place. Use only if safety seal is intact. © Copyright 2019 Professional Supplement Center, LLC, 5441 Palmer Crossing Circle, Sarasota, FL 34233. All rights reserved. Local time is 4/25/2019 1:54:58 PM.